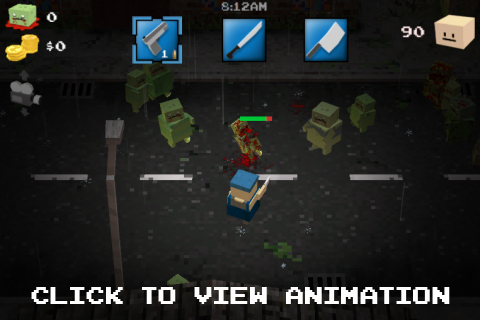 So, over the last two weeks I’ve been updating the zombie AI. The old AI system had many problems, was hard to update, and lacked many important features. So I started from scratch and implemented a behavior hierarchy, similar to the one described in this book. 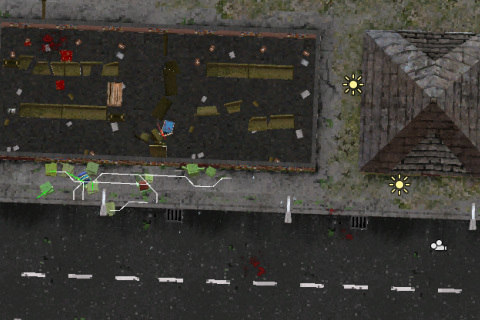 zombie AI is now sight/sound based. Zombies will tend to wander around aimlessly, until they see/hear something that catches their attention. 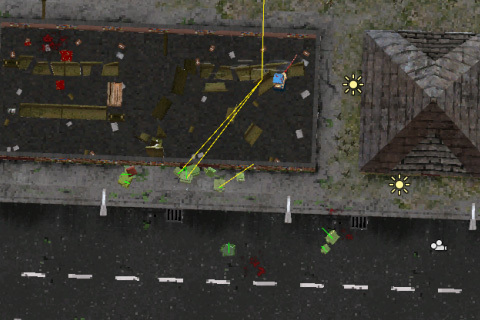 Things like the sound of the player hitting an object with a blunt weapon, or firing a gun will attract zombies, but they won’t automatically know what caused the sound. 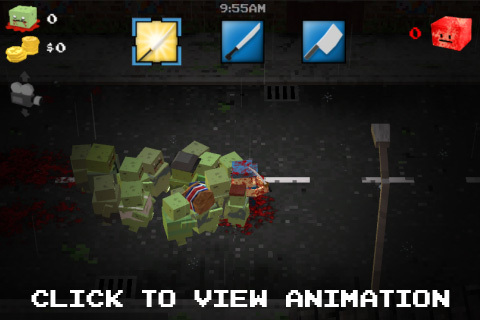 This means that zombies can be distracted with sounds while the player heads in the opposite direction. It also means that it’s now possible to sneak up on zombies from behind. zombies now flock more realistically. No longer will they randomly intersect walls, or the player, or each other. When attacking, they’ll also try to surround their target. 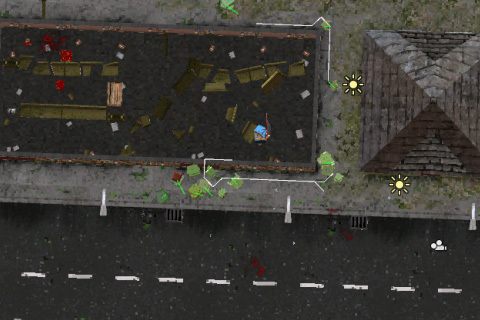 zombies will try to break down the doors of buildings, if they see a human/hear a noise inside. I’ve also improved several other aspects of gameplay. Items that require ammo now display their ammo counter inside their icon, when assigned to any of the active item slots. 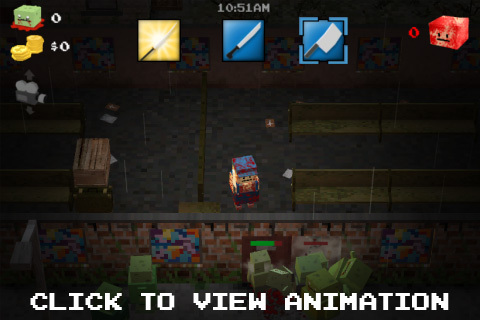 Also, zombies and props can no longer be hit through walls or other solid surfaces. Here are some screens showing the debug info I use to help me visualize the new AI system. White lines show new A* paths that are calculated. 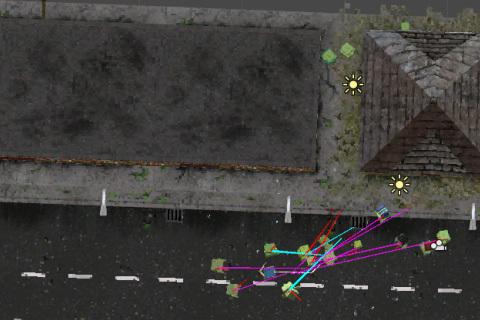 Green lines point to the next node on a zombie’s path when the zombies is following a sound. Magenta/Cyan lines point to a zombie’s active target (cyan = close, magenta = far). Red lines show the next node on a zombie’s path when the zombie is chasing a target (although zombies are allowed to veer off their path when the target is directly in range). Yellow lines point to a new sound that a zombie has heard. 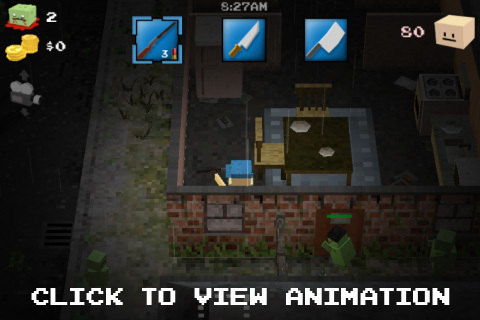 Here are some .gif animations showing various new features listed above. Hey Tyson, this looks amazing!! Is the book you posted the link to the only resource you used for AI? Also what language are you scripting in? Mainly that one, yes. I also own “Artifical Intelligence for Games”, which helped as well. I am not sure if you have answered this question before, but what are the chances it will be on Android? I have a Xoom Tablet instead of an iPad, and would love to be able to play it on there. Wow this game is so big, I think after you sell it on mobile you need to port it on pc or console. It’s gonna be a hit. The swarming looks and works really well. Like a good old fashioned moshpit. I commented on your latest post as well, and would love to see an android port. I am sure you are aware, but as soon as you get some advertising for this game… your going to have a huge hit. Congrats! As always you’ve been an inspiration, and continue to be one! I am pretty sure your doing just fine, but if your interested in investors let me know! Powered by WordPress v 3.4.2. Page in 0.185 seconds.